This inspirational husband and wife duo and their team work around-the-clock saving dogs with illnesses, broken bones, and deformities. This inspirational husband and wife duo and their team work around-the-clock saving dogs with illnesses, broken bones, and deformities– including a dog with two mouths. And they do all of this whilst juggling full-time jobs! Mutt Misfits is a United States charity that saves unwanted animals from potentially harmful situations and euthanasia. The group, which is run by family and friends, primarily focus on animals with major medical illnesses, injuries or advanced age that are often overlooked. The organization is situated in Oklahoma City. By partnering with the public as well as shelters, Mutt Misfits promote responsible pet ownership and the adoption of special-needs pets. It is their goal to “save the unsavable”. 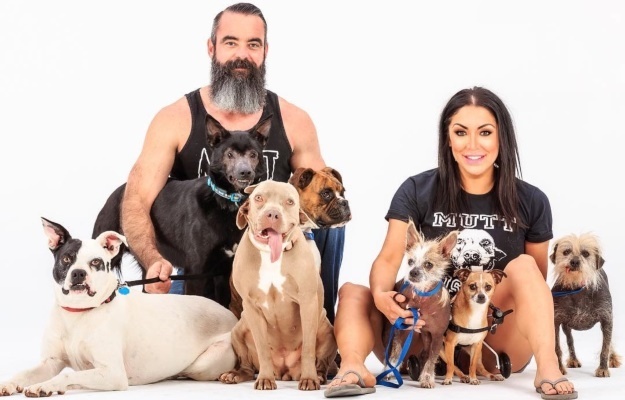 “Many moons ago, Mandy James and I worked as the rescue and foster coordinators for the municipal shelter in Oklahoma City,” said Heather Hernandez (32), Mutt Misfits founder. She’s also the adoptive mom to two-mouthed pup Toad. So, they started Mutts, along with Heather’s husband John, to focus on the pets that are usually overlooked. The municipal shelter in Oklahoma takes in about 25 000 animals a year, of which 25% are euthanised. The goal of Mutt Misfits is to lower the euthanasia rate by allowing animals with major medical needs a chance to receive care via their program. “Obviously our medical bills are insane, so donations are always needed,” Heather says. At first, her husband, John, was nervous about how much work the trio would be taking on but now he revels in the frantic workload. “When Heather and Mandy told me their idea of wanting to found our own organization, I was a little nervous at first,” he admits. “It’s a lot of responsibility and work to take on. We all have full-time jobs already, so this seemed a bit daunting – why take on another full-time job that we [won’t] even be paid for? “It’s been two years now and we’ve saved over 300 sick and injured animals along our journey. “It’s an insane amount of work and stress and time and maybe we lose a little sanity every now and then. But it’s been a fun ride and we’ve saved some really great animals,” John says. The cost for every animal brought to Mutt Misfits runs into thousands of dollars, despite the heavy discount the non-profit company receives from service providers. Some of the animals are completely healed and brought back to healthy, adoptable status. Unfortunately, some are not, so the company seeks out responsible owners who are willing to look after a dog with additional needs. “All dogs can make great pets, but the love and loyalty you receive from a special-needs pet is unlike any explicable bond I’ve ever felt before,” Heather says.